Starting from a default, standard submission form, modify it to suit your workflow. Add any number of user-defined fields to the form (check boxes, radio buttons, text boxes, drop down lists). 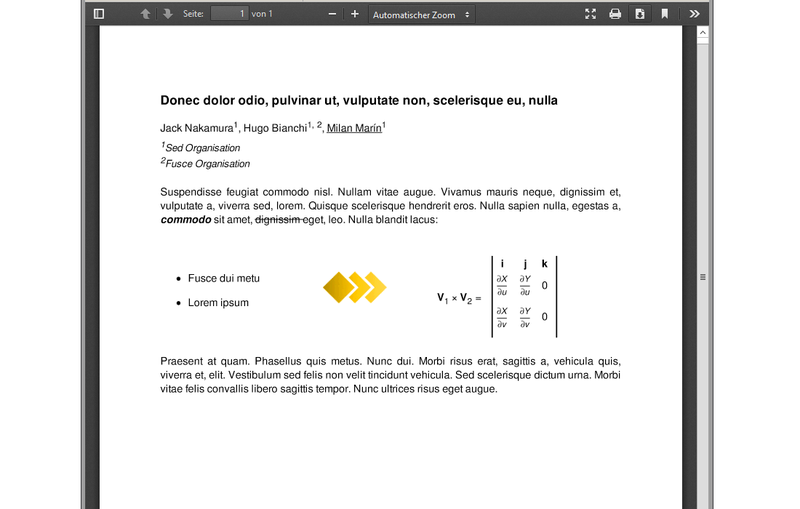 Add instructions texts, images and insert links to reference documents on or around the form. Style and format the abstracts. 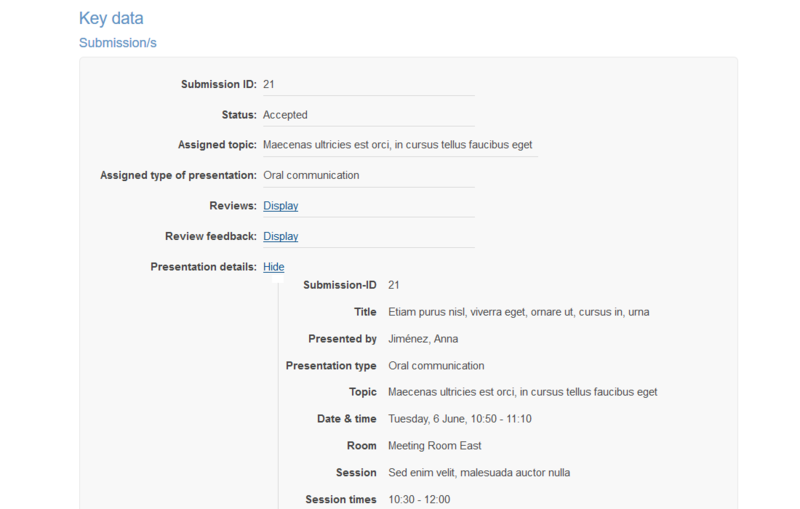 Extended abstracts can be collected together with the abstract, in one step. Full papers are collected independently of the abstract, typically after the review process. Gather the speakers' presentation slides and material ahead of the conference. 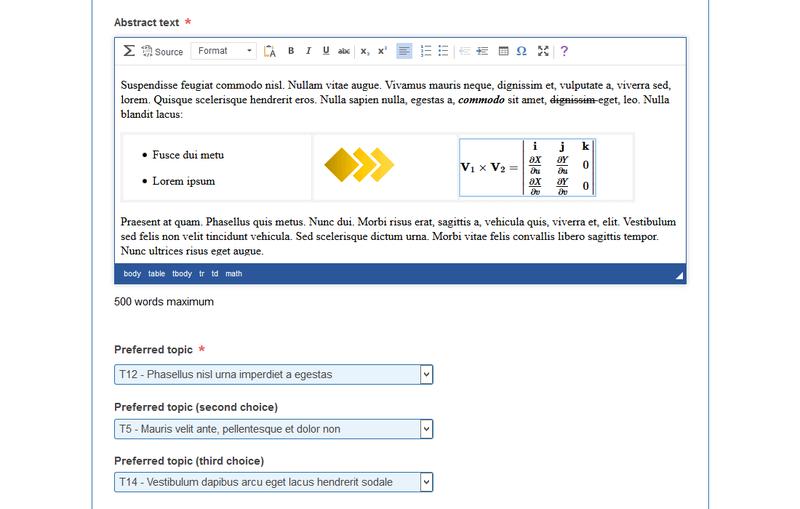 Choose between a rich editor or a simple text editor for the texts on the submission form (abstract title, abstract text and other text boxes). 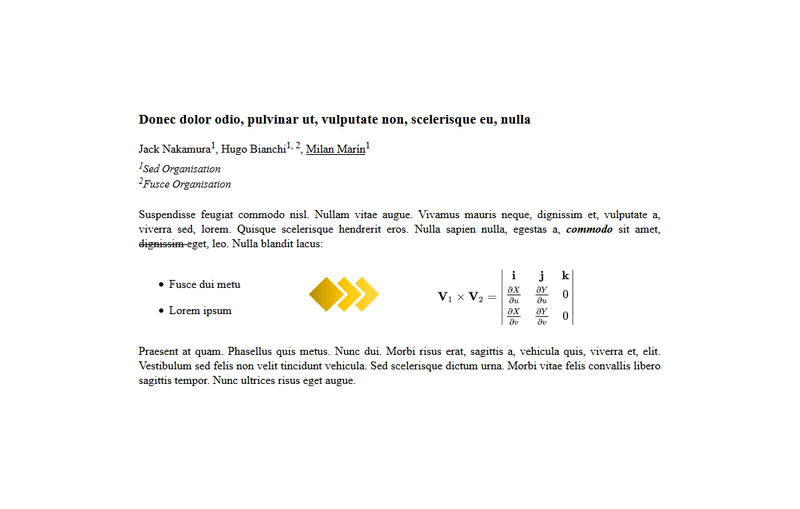 Decide whether to allow the insertion of pictures into the text of the abstract. Fine tune related options (maximum number of allowed pictures; maximum size, in KB, of a picture; type of allowed images). Decide whether to allow the insertion of equations and formulae into the abstract. 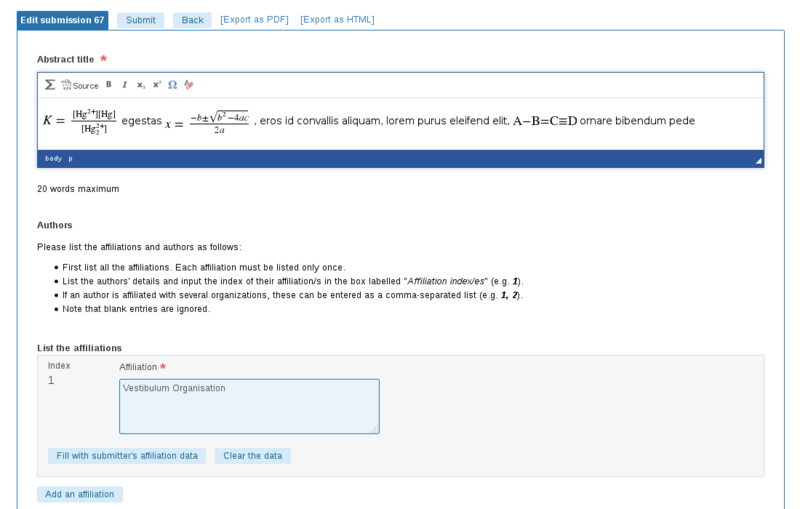 We use MathJax to handle mathematical equations and mhchem to handle chemical formulae and equations. If required, set a limit on the number of submissions allowed on each account. As an option, require that speakers have an account with the system. If payments are collected for conference attendance, you will then be able to check that the speakers have paid their attendance fee before finalising the conference programme. Choose between a one-level classification of the topics or a two-level classification into tracks and then topics within the tracks. 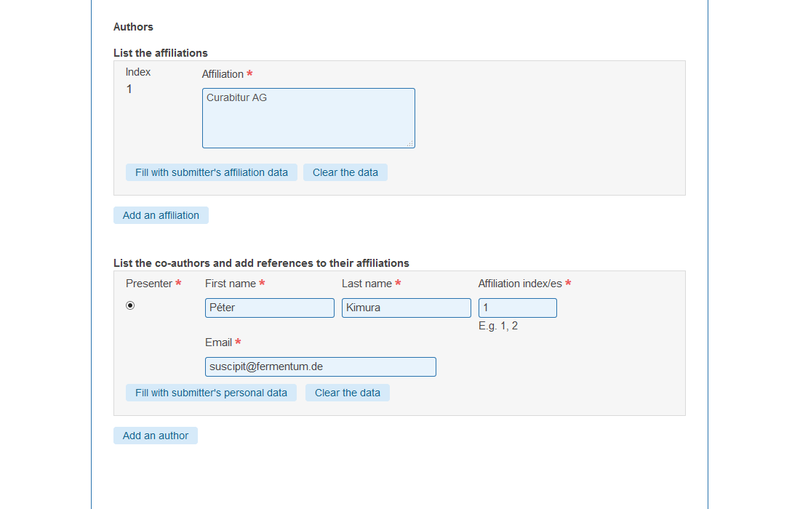 Allow the submitters of abstracts to indicate a second and third choice for the topics (and tracks, if applicable). Allow the submitters of abstracts to indicate a second and third choice for their preferred type of presentation. Let submitters choose from a set of pre-defined keywords or allow them to propose their own. Set a time period of availability for the submission process. Outside of this period, the submission form will not be accessible. Set availability times for functions associated with the submission process (editing, withdrawing of submissions). Set the availability times that fit your time zone. Submitters can export their submission to HTML or PDF, to check its styling and formatting. 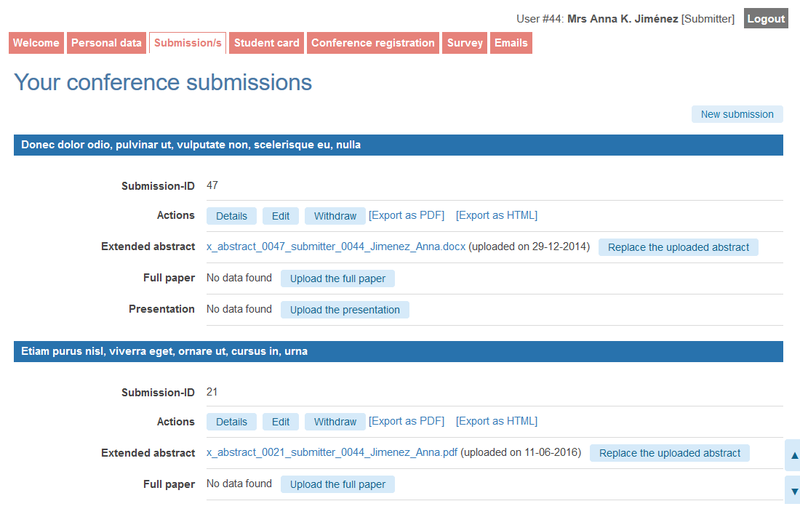 Administrators can export all submissions, or any subset of the submissions, to HTML, CSV, Excel, MS-Word and PDF. Set size limits on file uploads (extended abstracts, full papers, presentations) and pictures; control the allowed file extensions. Set size limits on the texts input on the submission form (e.g. abstract title and abstract text). Set a limit on the number of allowed listed authors, if applicable.